Well, they’ve done it again. Those nerds at Weta Digital have conjured another fully-formed digital character that is expressive, fascinating, and generally quite evil. After Gollum, Caesar, and all of those blue cat aliens, what else could they do to set the bar higher? Get Benedict Cumberbatch to voice the character. That’s what. The Hobbit: The Desolation of Smaug weirdly fractures its storyline and takes a great deal of focus away from the personal development of Bilbo, instead choosing to iris out for a much larger-scale view of the events which are so nicely encapsulated in the slender tome that makes up the printed, book-form story this film is based upon. There are exotic locales and fantastic beasts of all kinds, and plenty of action. I found myself dreaming up a ridiculous sequence involving the dwarves’ Barrel-Rapids Escape® (future name of a ride at the inevitable Middle Earth World Theme Park) right on the cusp of when said sequence actually unfolded in the film. And my, what a cartoonish and incredible sequence it is. Full of Legolas and arrows and orcs and glory. There are some vague, political themes floated at Laketown (pun intended) and Bard the Bowman is merely known as Bard the Barge-man. Stephen Fry does a delightful turn as the ignominious Master of Laketown, and Stephen Colbert plays one of his lackeys. Ryan Gage does his best to skirt the Wormtongue comparisons by pushing his character, Alfrid, into Gilliam territory. Everything culminates in a ruined-Erebor action sequence that is really strange, but definitely awesome. And seeing this film in 3D is a must. The action is dizzying. And there’s Benedict Cumberbatch. His voice also utters the Black Speech of Mordor as the shapeless Necromancer. No Gollum in this one. Kind of a bummer. 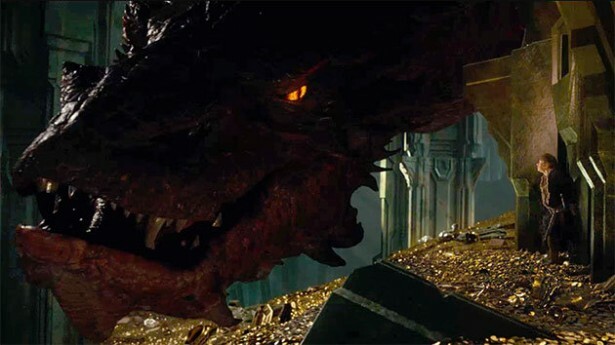 Gotta love Smaug, though.